DETROIT — Millennial- and Generation X-aged journalists represent three-fourths of the National Association of Black Journalists’ membership, according to a recent report. 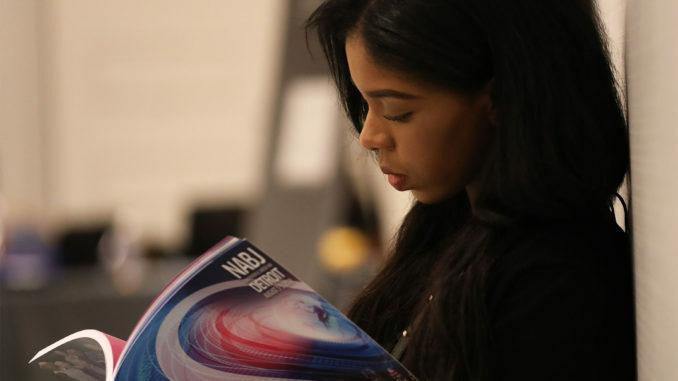 NABJ’s 2017-2020 Strategic Plan revealed that 44 percent of NABJ memberships are students and emerging professionals, while 40 percent of its members are under the age of 35. While the strategic plan acknowledged that many young journalists cannot offer strong financial support, NABJ’s newly appointed executive director and longtime member Drew Berry insisted there was general excitement from the board about more millennial and Gen-X members joining the organization. “I’m happy! It means that they are engaged in what we are doing,” Berry said. “Our mission is to engage them into leadership roles so that they will be better equipped than we are. Altogether, millennial and Gen-X members comprise 75 percent of NABJ’s membership, a statistic that President Sarah Glover and the rest of the current leadership have embraced moving forward. NABJ has set priorities that include mentoring and training young students, catering to the younger generation and becoming more involved on social media. The board of directors also wants to focus on innovation and reaching members through social media. “What is unique about NABJ is that we have amazing content. We have amazing capacity—our student programs, student project and annual convention,” Glover said. “But we have all the gusto in (millennial and Gen-X members) to back it up that maybe other organizations don’t have. But we do, so that is why we will carry on. Since its founding in December 1975, NABJ has invested in a wide variety of programming to support its student and emerging members, including its Student Education Enrichment and Development program, which includes the student multimedia projects, the student scholarship program and the annual career fair. According to some millennial and Gen-X members attending this year’s convention, another important factor in their participation in NABJ has been discounted membership rates and reasonably priced events. Ruffin, who is a graduate of Stillman College, first joined the college’s student chapter in 2012. But for the first five years of his career, Ruffin was able to enjoy discounted rates for membership as an Emerging Professional member. Two important objectives the NABJ Board of Directors has focused on are innovation and cross-training support. This means that millennial and Gen-X members can expect even more programs that they may find useful as they enter and move up in the industry. Xavier University senior and NABJ student chapter President Allana Barefield said her membership has paid off. This is Barfield’s fifth year as a member of the organization and the fifth convention she has attended. She has previously served as a mentor for NABJ JShop, which provides training for high school journalists, and was excited about this year’s convention being held in Detroit. Other ideas proposed by younger members in Detroit for the convention included an increase in entertainment-based panel discussions as well as more plenary sessions featuring experienced and prominent journalists. “I definitely want to see the partnership of NABJ and NAHJ like we did one year because it is great to have diversity all in one setting,” said Aaron Ladd of WMBF News.